A full twenty-five years after the release of Baka Beyond's debut album, Spirit of the Forest, the band celebrate their beginnings with a date in Sussex, re-joined after a long absence by Paddy Le Mercier, a member of the original line-up. Eleven albums on, the band continues to pay homage to the captivating music of the Baka people, using it to explore their own African and Celtic roots. The band's conception is the stuff of legend. Borne out of an impulsive dash to Cameroon to meet indigenous Pygmies, the Baka, following the viewing of Phil Agland's documentary, People of the Rainforest, UK-based musicians Martin Cradick and Su Hart were captivated by the music they heard there. Returning with field recordings and a clutch of newly learnt techniques – including a kind of yodelling called 'yelli' – Martin and Su worked with legendary producer, Joe Boyd, alongside fiddler Paddy Le Mercier and other friends and collaborators, to conceive Spirit of the Forest – which heralded a new, worldwide audience for the music of the Baka. As the album made its mark, so, too, did the band, evolving explosive sets on the festival circuit and recording subsequent albums. And, in order to ensure that the Baka people remained as central to the project as was always intended, Martin and Su established Global Music Exchange (GME), a charity to raise funds and support the Baka in health, education, housing, development and human rights. 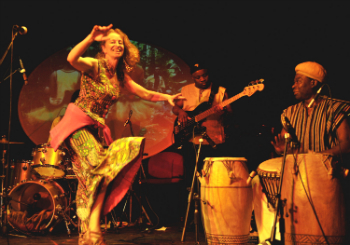 The band and the charity have since entertained audiences across the world and demonstrated the challenges the Baka face – environmentally and socially – through the Forest Voices film screenings. They have even taken Baka musicians on tour. And in October 2018, Martin, Su and Paddy, along with the band's current musicians, will be out on the road, celebrating where their story began – the songs, the sounds and the spirit of the forest. Baka Beyond play The Fitzroy in Lewes, East Sussex, on 13 October 2018. CLICK HERE for info and tickets.